Had my dinner at 10.30 pm today. And i did not eat any lunch. Not to mention any breakfast. Which means that my first meal of the day happens to be my dinner which happens to be at 10.30 pm. Wahliao, it's something like puasa (fasting) already. Come to think of it, in this last few weeks my eating plan has been completely screwed up, with me skipping lunch almost everyday and now my dinner is my new lunch while my supper is my new dinner. As i was contemplating about my recent eating pattern and the current complains about weight from so many of my friends, a spark of inspiration! After a detailed planning, the author of Lukey's Rantings is proud to introduce a new, futuristic and out of this world method to lose weight! Called the Lukey Diet Plan, this diet program is totally, completely and awesomely different from the conventional diet plans like those Atkins Diet, Low Carb Diet, Eat All You Want Diet, Detox Diet or All In One Diet. After signing up for this program, participants will be placed in top universities around the world, to ensure that there is a maximum amount of stress during the whole course of the program. The whole length of this program will be three and a half years, which is quite good because conventional method requires four years to get a BA degree. Because of the handsom-ness of Lukey's Rantings' owner, we are able to negotiate this fantastic deal with universities around the world to cut 6 months off study for Lukey Diet Plan's participants. So, how will this plan work? All you have to do is to pick a course at any available unis that are partnering with us and attend the uni as any normal student. Due to the high amount of workload and stress in these unis, sooner or later you will find that you simply have not enough time to eat all 3 meals per day. One of the reason why this Plan decides to cut off 6 months of normal study time is to pack all the classes during the 6 months into the remaining three and a half years is to ensure that you have at least 8 hours of classes per day. Besides that, another requirement of this Plan is to have you join LOTS of co-curricular activities (CCAs). The reason is to increase the amount of stress you have to face of having to balance between studies and CCAs. Furthermore, your free time will be further decreased because you need to attend these CCAs meeting from Monday to Friday and be committed to all their activities, which will roughly take up at least 2 hours per day, everyday. With the high amount of stress and the inability to find time for meals due to study and CCAs, you will soon find out that your weight will begin to drop after a few months into the program. 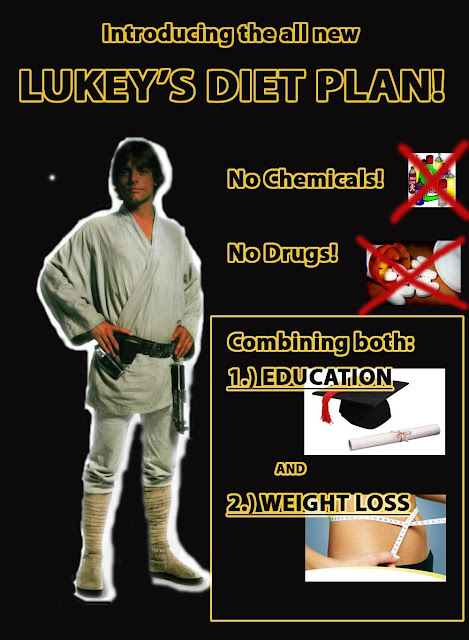 By the end of three and a half years, Lukey Diet Plan guarantees that you have achieved the weight that you have always wanted and to make it better, you have also earned a BA degree in less the time people take! So, what are you waiting for? Sign up now and enjoy 10% off your first year's tuition fees! I believe that your diet plan should revolve around eating breakfast and lunch. It's an actual fact that if you do not eat breakfast, you are more prone to gain weight since eating first thing in the morning jump starts your metabolism. When choosing the right diet plan, I believe that a well balanced diet revolves around eating healthy and maintaining a workout regiment that best fits your body type. If you are looking to count your calories and keep track of what you are eating, head over to http://www.FitClick.com and try the Online Calorie Counter. This counter helps count your calories so you don't have to! Good Luck!